When passion rules the game! Yes, that is a Scorpion classic and that is what a small outfit that started out as a result of pure passion is now shaping up to. Vardenchi. A group of passionate bikers lead by Akshai Varde from Mumbai, India has rapidly turned heads in India with their iconic designing. You might remember the name from a previous post. In a resource limited country (nice word I picked up working in public health), where to put your passion into artful craftsmanship, you have to rely on only a single brand (read Royal Enfield), Akshai and his talented band has churned out many artful designs on the Royal Enfield each distinctively different from each other. To view some models, visit their website. And then take a look at their blog to see their new creation, Vedic Chopper, it will blow you away! The photos are all there, will definitely post the chopper if I get some more info on the bike. Now Vardenchi is a full fledged custom motorcycle manufacturing company. And similar to their famous cousins in U.S who designs for Hollywood stars, Vardenchi is quite popular among Bollywood stars. 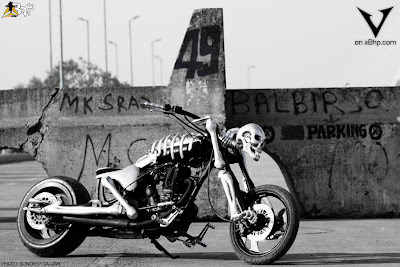 Jackie Shroff, a former Bollywood hero had approached Akshai to design a bike in the form of a skeleton after he saw a similar bike on the net. And what you see here is the end result. An example of how to create an obnoxious concept into a stunning visual delight. 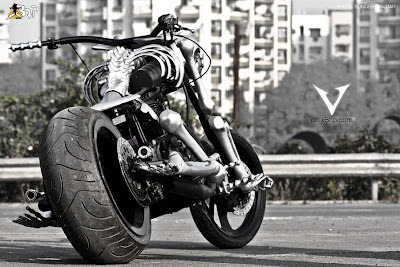 Vardenchi has created a ‘skull’ bike on the lines of the bike that Hollywood star Nicolas Cage rides in Ghost Rider. So I believe that they did have a head start. But that’s the negativity of it. Making a onetime concept is something, improving on it and that too this dramatically… now that’s real talent. Akshai says "At Vardenchi our philosophy is quality first. It may sound very clichéd but it is the fact. Back in the day when we had just begun I vowed to build to the most spectacular rides the country has ever seen, and along the way I have learnt the importance of many other factors that go into creating the perfect ride like comfort and ride appeal. Today all aspects of customization of the motorcycles is looked into and we hope to create a custom motorcycle that will be world renowned and put India on the map in one more field." Like all custom bike builders, there are some basics Vardenchi always follows. Their technical uniqueness is the single sided swingarm with integrated disc brakes and the belt drive. If you know India, you will know that besides Royal Enfield, the biggest bike in terms of ‘cc’ that is completely made in India is the Bajaj Pulsar 220, a 220cc single cylinder engine. The Royal Enfield stable horses are not much different either when it’s about the machine as all are single cylinder air cooled 2 valve engines with twin suspensions at the back. A throwback at the 60s… Aah! And that’s the reason why we really need to even more acknowledge Vardenchi’s work as they have to make everything in house, they cannot out source anything even the paint or the cost would get sky rocketed. The Vardenchi choppers are a perfect blend of classic and new age motorcycles. They will provide you with such a range of varied styling options that you will feel like a young boy at the candy store. You can just tell the gang on your preferences and the bike will be probably better than what you had conceptualized. There will be only one thing similar, the distinctive styling of Vardenchi. They use the finest qualities of paint and chrome available to give that world class finish to the motorcycles. The client is kept in very close interaction during the entire process of design and building. Akshai Varde adds "We took the engine of a Royal Enfield Thunderbird and began creating the skeleton with a rough framework of metal structure. Several layers of plaster of Paris packed with fibre glass compound created the fine look of dry bone on the bike's surface. After days of work, we had the beginnings of a skeleton. The silver finish is unique as it is neither gloss nor matte but seems as if it was cast from aluminium. The hands and legs have pivot joints so that when the rider rides it, the bike gives an impression of a galloping skeleton. The final touch was the LED light in the skull's eyes so that we could scare people at night. The bike is a lot of fun to ride and gets more stares than you can imagine." Way to go Akshai and your band of bikers Vardenchi. The thing about this Skeletor is that you must have seen a few bikes with the same concept, but this actually is a beautiful bike. It really is. It has all the look of a chopper and it also has the concept allthrough the bike. It really is a beautiful fusion. 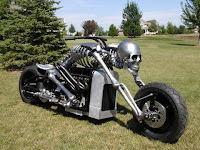 I mean you can either make a beautiful cjopper or else make a beautiful bike in the form of a skeleton. It’s the fusion that is really enthralling. Also a special note to from where I got the pictures. XBHP is a motorcycle forum which has its roots in India. This article had appeared in a link on the forum. Here is the original post. Sunny or Sundeep Gajjar, the man behind XBHP, is the guy who took the photos. He is an amazing photographer and one just can’t ignore, but mention his beautiful photography. Is it really his photography or the bike I don’t know, maybe both, but the Skeletor is one definite stunner. Visit Vardenchi to know more about their work. Here and here are 2 links to posts about the bike with Jackie Shroff.